FS4 is a 4-Channel 2K/HD/SD or 1-Channel 4K/UltraHD frame synchronizer and up, down, cross-converter. AJA’s flagship frame synchronizer and converter offers incredible versatility and connectivity in a sleek 1RU frame for all your 4K/UltraHD and 2K/HD/SD conversion needs. Offering a wide range of connection options for both video and audio, FS4 can do the work of four separate devices in 2K/HD/SD or combine all processors and channels together for maximum flexibility for 4K/UltraHD productivity. AJA's FS family brings the full power of their hardware conversion expertise within compact 1RU rack units that offer unrivalled flexibility. Delivering AJA's industry standard up/down/cross-converter technology for the highest quality images, FS units are ideal for high-density applications such as mobile trucks and packed machine rooms, able to replace multiple hardware units in a single rack slot. A wide range of conversion possibilities makes them perfect for converting disparate sources to a common format, or handling whatever formats the production environment might throw at you. New thinking requires a new layout and FS4’s front panel has been redesigned to simplify and speed your access to the product’s wealth of features. The panel has also been designed to provide straightforward operation in single channel or four channel mode. In four channel mode, all four VIDx buttons under Channel Select are lit up. In single channel mode, only VID1 is lit and VID2-4 are off. Moving to 4K is never an instant change. Legacy signals and archival material need to be integrated into the 4K environment while 4K sources need to be down-converted for current 2K/HD pipelines. Utilizing AJA's remarkable conversion algorithms, FS4 supports up, down, cross-conversion from SD, HD or 2K over 12G/6G/3G-SDI video to 4K or UltraHD video and back. Both Quadrant (Square Division) and 2SI (Two Sample Interleave) output formats are supported. All done in beautiful 10-bit with dedicated hardware. Video and Audio deserve the connectivity and bandwidth required to meet the demands of your projects. FS4 utilizes standard BNC as well as optional SFP inputs and outputs to integrate easily into a variety of workflows and facilities with support for SDI worklows all the way up to 12G. FS4 has BNC and Fiber* inputs and outputs to accept 4K/UltraHD/2K/HD/SD resolution SDI signals in Single Channel Mode. 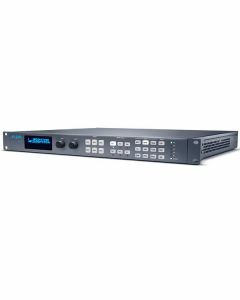 In Four Channel mode 2K/HD/SD inputs can be be routed to multiple locations simultaneously without the need for any external signal distribution. A looping Reference input allows the FS4 to be locked to your house reference signal for rock-solid stability. Digital Audio can be disembedded and embedded between SDI, MADI and AES for an incredible array of routing possibilities. * SFP inputs and outputs are optional. FS4's SFP options include both 12G/6G-SDI HD-BNC and Fiber I/O options, allowing great SDI flexibility and fiber cable runs of up to 10 kilometers to be connected directly to the FS4 without the need for separate fiber to SDI conversion. Choose from multiple wavelength CWDM SFPs, allowing advanced multiplexing of signals over a single fiber connection. The growth of 5.1 and 7.1 audio has increased the number of audio channels that must be managed in a production, The MADI standard provides a convenient way to transport huge numbers of audio channels along a single cable, simplifying the cabling demands for broadcasters, mobile trucks and production. FS4 supports both fiber and coax MADI input and output. An internal 277 x 208 mono audio matrix allows you to route 1 to 1 or 1 to many with full routing of MADI, mixdowns and all audio coming from SDI, fiber and AES sources for an incredible amount of audio processing capability in a single box. FS4 supports closed captioning and the conversion of closed captioning between 2K/HD/SD and 4K/UltraHD formats - including full conversion of CEA-608 and CEA-708 standards. FS4 can preserve closed captioning even when converting between formats, removing the need to re-insert closed captions after conversion. Automatically sets Active Format Description information to match the converted signal. This means AFD information does not have to be inserted after conversion and provides accurate information for devices that understand AFD. FS4 is network ready and supports SNMP monitoring and web-based remote control. Units can be connected to any Ethernet network via the built-in 10/100/1000MB Ethernet port, allowing control and configuration of multiple FS units from any web browser on a connected computer. Configurations can be saved and applied to multiple units, ensuring consistency and quick configuration in large installs. To integrate smoothly with the existing automation of a facility, FS4 can also receive external GPI commands to trigger a variety of functions. 100-240 VAC 50/60 Hz (Dual, redundant power supplies), 55W typical; 70W max. 15A max.